Using an old-fashioned motif of chalk on blackboards (does anyone other than this writer remember them? ), Joanne Quinn, Falvey’s graphic designer and Communication & Publications team leader, created an exhibition based upon two events occurring on April 26: Falvey Scholars Day of Research and Sigma Xi’s Day of Research. 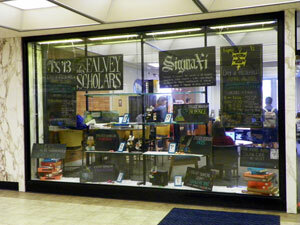 To the right of the Falvey Scholars section is information about Sigma Xi, the international honor society of research scientists and engineers. A large blackboard gives the society’s mission and the Villanova chapter’s schedule of events for April 26. The Falvey Scholars Award is an annual event cosponsored by the Library, the Honors Program and the Center for Undergraduate Research and Fellowships. Faculty advisors nominate their senior students; the nominees then submit an application to the Falvey Scholars selection committee. The committee includes representatives from the Library and each of the Colleges (College of Liberal Arts and Sciences, Villanova School of Business, College of Engineering and College of Nursing). The successful candidates will present their research, highlighting their use of Falvey resources. University Librarian and Library Director Joe Lucia will give a brief talk following the students’ presentations. Lucia will emphasize the importance of undergraduate and graduate research on campus. He will also mention the Sigma Xi Day of Research, held in the Connelly Center after the Falvey Scholars program. Sigma Xi, founded at Cornell University in 1886, is an honor society of research scientists and engineers which has included women as full members since 1887. Sigma Xi now has over 500 chapters and nearly 60,000 members in the United States, Canada and abroad, wherever scientific research is conducted. Nostalgic and informative, this exhibit is well worth visiting. Alice Bampton is a digital image specialist and senior writer on the Communication and Publications Team.